“Column and slab” is our third residential work. 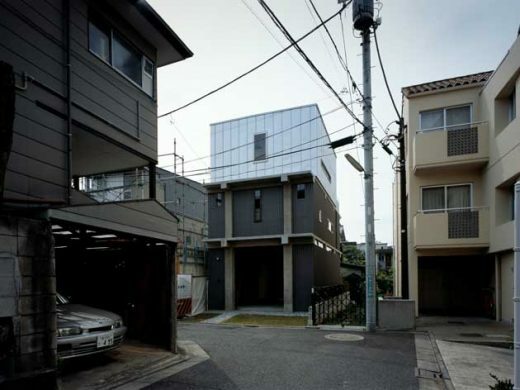 Whilst the context is similar to that of our previous two projects, “e-house” and “s-house”, which were located amidst the densely built-up area of Tokyo, the form and meaning of this house turned out to be something quite different. The site, at 5m x 14m, is small and narrow even compared to its modest neighbours. Furthermore, it is bounded on three sides by the adjacent plots, leaving only the narrow frontage open to the road. The main theme of the two previous works, was to deflect the effects of urban density through the use of devices such as the free-form, cranked screens. However, on such a tight site, it is not enough merely to deal with the feeling of oppression brought about by the dense surroundings. From the first time we saw the site, we had wanted the house to evoke the historical form/typology of the dwelling and to challenge the urban environment. As ground improvement was necessary, a grid frame of columns and beams was employed, and the groundwork was confined to the areas beneath the columns. Next, the columns bearing onto the foundation were brought inside the house, resulting in the cantilever of the floors at the sides, maximizing the width of the building. The columns are integrated within the interior of the house. During construction, the site resembled an excavation of Japanese ancient columns. The 300mm square concrete columns are positioned on the 2.6m x 3.0m grid and support the two 100mm-thick raised floors. A timber box sits on the top of the concrete building like a penthouse. This simple and clear structure is a logical solution dealing with the client’s wish for as much space as possible, while at the same time, addressing the restrictions imposed by the urban environment and regulations. However, this would not have been possible had it not been for the cooperation of the client who joked that the rough concrete columns were like additional members of the family. On entering the ground floor, there is a comfortable sense of tension, instilled by the grid of columns marking three spaces of approximately 4.5 tatami-mats in size, arranged along the length of the house, and by the 0.95m aisles on either side. This floor is called the “doma”, an earthen floor room, and it brings the outside and the city into the house. The floor-to-ceiling height of the first floor is moderately lowered, creating an impression of both tension and intimacy, while the mobile storage and the light well loosely divide the bedrooms from the bathroom. On the second floor, you are greeted by the simple box-form space with its generous openings and relaxed atmosphere. This is where dining takes place and hence where the domestic hub lies. The eight columns, in place of partitions, adapt flexibly to the changes that will occur in family life over time. Not only do these concrete columns have a structural function, but they also harbour the potential for other functions in the future. In Tokyo today, the houses that are built do not adhere to any particular order or set of rules. Amidst this sprawl of unrestricted confusion, we wanted to create a house that was akin to a museum. Integrating traditional forms into everyday life, allows the house to establish links to tradition and to create a sense of spatial tension. The grid frame is modernist, while the columns and the raised floors are traditional Japanese forms. These established forms will play a vivid part in their contemporary setting. We are in the process of developing a language that employs forms without being nostalgic and traditionalist.